Its not known exactly when the first individual Cabs applied for hire on Jersey roads but the first private company to register was in 1850, called the 'Economical Conveyance Company' they had livery stables for 20 horses and premises in Belmont Road for 10 carriages, They tried running on a very economical basis of 4d a mile and they used small one-horse vehicles similar to Paris fiacres. 'A fiacre is similar to the picture opposite and a form of London Hackney coach which was a horse-drawn four wheeled carriage for hire'. The earliest horse-drawn vehicles used for public hire were known as 'Cabs', Horse-drawn Coaches that carried larger groups were known as 'Charabancs' and usually had bench style seats. but the 'Paris Fiacre' on the other hand was very neat and comfortable. The attempt to distribute cabs for all parts of St Helier was found to be an economic failure and the rate of charge was insufficient for the experiment to be a success. by 1853 the company sold up and no longer appeared in the registry books. In 1823 a two-seat, two-wheeled carriage called a cabriolet was introduced from France. It was very popular for its speed and comfort and from this vehicle we derive the term ‘Cab’. From the late 1830s, two types of Cab began to dominate the streets of London, the two-wheeled hansom, a fast and elegant carriage and the ponderous four-wheeled ‘growler’ which, with its luggage carrying ability was to be found mostly at harbours and railway stations. 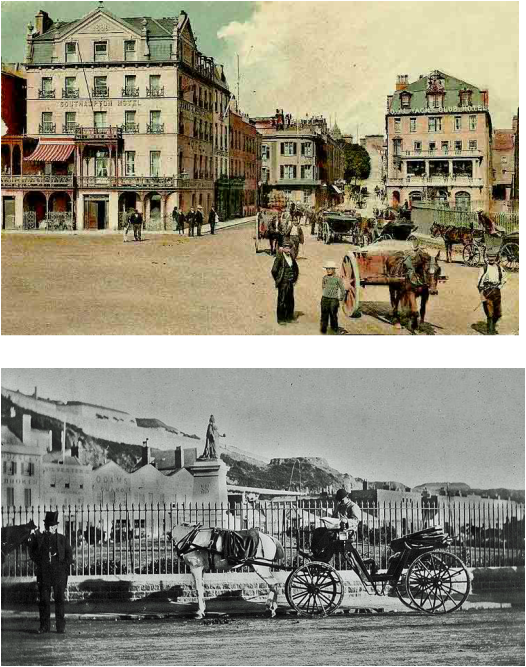 Opposite is a picture of Broad Street taken in 1875, this was one of the best early pictures of anywhere in Jersey. The photograph was one of a number of surviving pictures of the Street taken by Ernest Baudoux and it shows clearly that the street was surfaced with cobbles and that there were horse-drawn carriages waiting near to the Pierre Le Sueur Memorial which had been completed in 1855. The carriages there could have possibly been for hire as we know this was definitely a Taxicab Rank back in 1890 and continued to be until it was partly pedestrianised in 2005. ​​﻿To the right we have an ﻿﻿early postcard view of the Weighbridge area, some of which were expertly hand-coloured to produce exceptional images of this important part of St Helier﻿﻿ the photograph was probably taken in the last decade of the 19th century, or the very early years of the 20th, it﻿ shows the Southampton and Royal Yacht Hotels which both stand today. The circular garden and statue of Queen Victoria are out-of-shot in this photo and have since been removed, however you can see to the far right of the picture part of the green railings that enclosed the circular garden, and we can see horse-drawn carriages alongside those railings, we know that Cabs and Charabancs applied for hire next to this garden, and each driver was given his own licenced stand. The next black and white photo clearly shows the statue of Queen Victoria in the middle of the circular garden, (The statue was removed in 1970 and put outside the Tourism office near the Weighbridge, this was a temporary position as it was removed again in 1976 to the small triangle park next to the Grand hotel which was renamed Victoria park). We can see in this picture a cab driver on his stand by the railings more or less waiting in the same area of the Weighbridge 'Public Taxi Rank' today, at first glance the Cab driver looks like he has a headless horse! but the picture was obviously taken when the horse had his head turned to the right, probably having a good old scratch while his driver passes the time of day by reading the paper while patiently waiting to be hired, 'Not much has changed in that respect for Taxi drivers waiting there today!'. This old post card picture was taken 1903 by local photographer Albert Smith. The picture shows horse-drawn carriages awaiting the arrival of the mailboat at St Helier harbour, some of the island hotels also supplied transport for their guest besides the Taxicabs and Private Coach Companies. The first petrol Taxicabs in the UK were made by Austin. 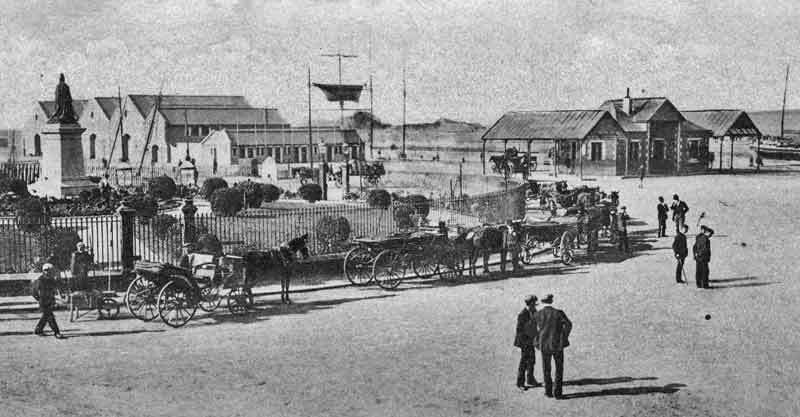 The picture above taken in 1908 shows a line of horse-drawn Cabs for hire where later motorised Taxis would queue, until most of this area was given over to the JMT bus company in the 1970s. It was also in 1908 that first Cabs were officially licensed by the Parishes and records kept of the driver's name and address plus plate and badge number, and they were recorded as being Cabs, the driver was given a plate number to go on his horse drawn-carriage, starting at number 1 and up to plate 81, this was also the drivers badge and stand number. The licence gave permission to apply for hire at the harbours and Public Stands (known as Public Taxi Ranks today) St Helier records show that 67 Cab drivers were registered to apply for hire, back then the Parishes licenced and issued Cab plates and badges but unfortunately not all records were kept. In 1909 Mr. Frederick W. Clarke registered the first Motor Cab onto the island roads, he was issued with plate number 67, but the make and model unfortunately was not recorded in the Parish records. In 1897 London’s first Motor Cabs were electrically powered. They were called Berseys after Walter C. Bersey, the manager of the London Electrical Cab Company who designed them, but were nicknamed ‘Hummingbirds’ from the sound that they made. Most numerous makes of Cab post-1906 were the Unic, introduced by dealers Mann and Overton and the Napier and Panhard, both operated by W & G du Cros. Also to be found were Fiat, Sorex, Belsize, Austin, Humber, Wolseley-Siddeley, Argyll and Darracq. The idea of motor vehicles certainly didn't catch on at first in Jersey as 6 years past before we see another motor vehicle being registered and issued with Cab plate number 35. The Parish records gave the name of Mr. Arthur A Pitcher, as owner and plate holder, this time the registration number (J348) was logged down and the make entered was a Brougham motor vehicle, and dated the 20th May 1915. It is not known how accurate these records were back then because the Jersey registration records kept at that time for all vehicles in the island had the same registered owner with the same J number but the make of car was entered as being a Deasey? This was more likely to be accurate as the the Siddeley-Deasey motor car company was manufacturing in Coventry around that time while the Brougham was an American Car manufacturer. However we cannot be to sure as UK industrial action by Taxicab drivers in 1911 over fares and in 1913 over fuel almost crippled the trade and severely reduced the number of big fleets and the manufacturers associated with them. At the outbreak of the First World War in 1914 there was just one make available to buy and that was the Unic. In the UK production of the Unic ceased for the duration of the First World War as the company turned to producing munitions. The majority of younger cabmen were called up to fight and those that remained had to drive worn-out Cabs. By 1918 these remnant vehicles were sold at highly inflated prices, often beyond the pockets of the returning servicemen, and the trade deteriorated. THE EFFECTS OF THE FIRST WORLD WAR IN JERSEY. In 1916 registered Cab driver numbers fell significantly in Jersey, the Parish records show that there were only 12 names registered as plate holders, some of these names registered also had Cab companies and held more than one plate, altogether there was a total of 31 plates registered between them, compared to the 67 plates registered in 1915. Therefore the number of plates had more than halved by 1916, perhaps these men had signed up to join the other 6000 Jerseyman who had left the island to fight in the First World War. The Parish of St Helier kept no more records from 1917 onwards until 1920 when they started again, in that year 82 cab plates had registered. It was noticed that only 18 names out of the 67 from 1915 re-registered for the same plate number in 1920. Furthermore 12 of these names were registered plate holders in 1916 so we can presume that these men had not been sent to war, probably because of age or disability. Only six names reappeared again from the 1915 records, were they the only survivors? In London the fitting of Taximeters was made compulsory as early as 1907 and cabs became known as 'Taxicabs,' today this is abbreviated to 'Taxi', but the name Taxicab in Jersey wasn't being used until much later and was first mentioned in the late 1920s. In 1930 some 31 drivers stated in a petition that they sent to the Constable of the Parish of St Helier that they were full time Taxicab drivers, and these full time drivers wanted a change in rules that would stop drivers who only worked during the summer months from using the stands (Public Ranks). It was pointed out to the Constable that these part time drivers worked in other occupations during the winter months, whereas the full time Taxicab driver was committed to providing a good service to the public all year round, even during the quiet winter months when they found it hard to make a living, but as soon as they had a chance to earn more during the busier summer months the Parish of St Helier allowed another 30 drivers to apply for hire on the stands, so they complained that these part time drivers not only had other occupations during the winter months to fall back on and were not committed to serving the public all year round but only came onto the stands (Public Ranks) to serve their own personal interests and convenience and not the public's, therefore they appealed to the Constable to allow only full time drivers onto the stands thus allowing them the chance to make a fair living throughout the year!. It was around 1932 that we start to see more motorised vehicles on the record books being registered as Taxicabs, the numbers grew every year as they became more reliable and a popular means of transporting people around the island. In 1935 the Jersey States Motor Traffic office took over from the Parish authorities and were given total control of regulating and registering the Taxicab industry on the island. The first registry book they kept in 1936 included the plate holders name and address, all the PSV plate numbers started with A1 up to plate A167 plus for the first time the registration number of all the vehicles were included, and then a separate list for PSV Badge holders. That year they also introduced the new Taxicab regulations and 30 of the longest standing plate and badge holders were to be known as Public Rank Taxicabs and Broad Street Rank was given over to them exclusively. 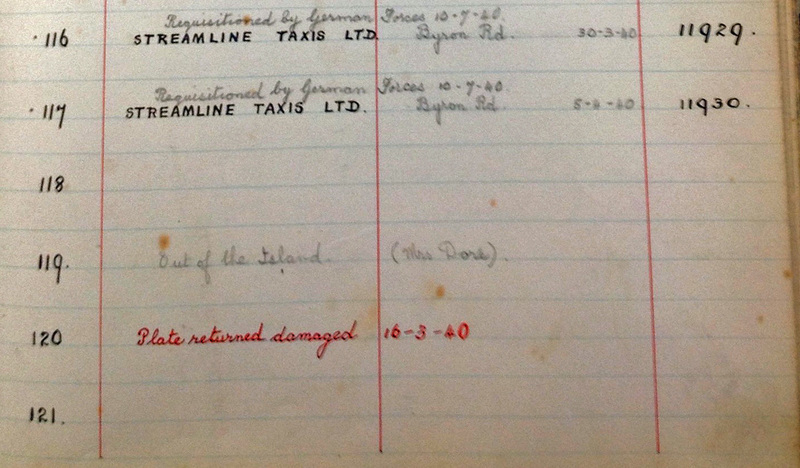 Streamline Taxis Ltd lost the most that year as they held 12 plates altogether and the records show that 5 of their vehicles had been requisitioned by German forces in 1940. You can see in the photo to the right the registry book kept in 1940 shows that some drivers and Companies were starting to loose their vehicle as it was recorded German forces had commandeered 12 Taxis that year and more were to follow. Within days of the arrival of the Germans, Jersey people had to come to terms with new laws and orders such as no cars were allowed for private use, the German currency was introduced with an exchange rate of nine Reichsmarks to the pound, and new curfew laws, and of course there was fuel rationing. 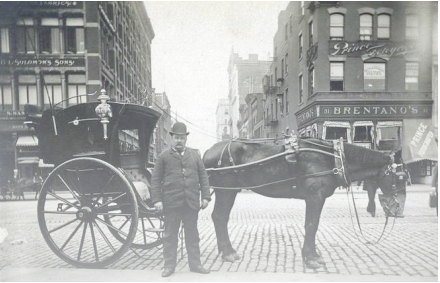 By 1941 the number of Taxicab plate holders fell to only 12 registered, fuel was now in short supply or unavailable and buses were converted to run on gas, wood, charcoal and finally to be drawn by horses. The Germans changed the rule of the road from driving on the left to the right, buses were forced to set down and pick up their passengers in the middle of the road. these conditions made it impossible for any Taxicab driver to make a living and most of the vehicles had now been commandeered by the Germans anyway. ​were recorded in 1943 and 6 in 1944. In 1945 we see that Taxicab drivers who had survived the 2nd World War and occupation of the Island were again registering with the Motor Traffic Office, that year they recorded 52 PSV plate holders, and 47 PSV badge holders, a decade later and the numbers had risen to a total of 227 plates registered, 84 of these were Public Rank Taxis and 133 Private Hire Cabs. 1955 and new regulation is passed that all Public Rank Taxis were to be fitted with a Taximeter approved by the Motor Traffic Office and each meter was to be sealed and no one unless authorised by an inspector of the Motor Traffic Office was allowed to remove or tamper with the seal, ﻿and this law still applies today. Taxi fares were now controlled and set by the States of Jersey Defence Committee, but this rule did not apply to the Private Hire Cab Companies. 'Some Taxicab drivers had already fitted meters into their vehicles long before this regulation was passed'. Early Taximeters were totally mechanical in operation and the clock that recorded waiting time had to be wound by hand, Meters of the 1960s and 1970s had a built-in electric clock, but today Taximeters are fully electronic and calculate the fare payable as a combination of time and distance. When the Taxi is in motion, it records distance and when the Taxi is stationary it records the time spent standing still and adjusts the fare accordingly. During the 1950s with the rapid growth of home telephones it became extremely easy to contract for-hire transportation and some Taxicab drivers quickly realised that their market was going to move towards trips ordered by telephone. Companies like Luxicabs formed and moved into depots, operators were set up to take telephone bookings and customer accounts, the jobs could now be despatched to vehicles fitted with new two-way in car radios systems, this was the start of the what is now known today as 'Private Hire Taxicabs'. They were still regulated by the Motor Traffic Office, however they were allowed to set their own fares which were higher than Public Rank Taxis to cover the costs of providing a door to door service and the associated overheads of running expensive depots which included the need to have vehicles garaged and off the streets in-between jobs. The owner drivers also had to pay weekly rents to the depot owners to cover the costs of these new overheads and their customers didn't seem to mind paying extra to get the door to door service. During the 1960's there were 267 registered plate holders, 167 were Private Hire and 100 Public Rank Plates. In 1965 new Taxicab regulations were brought in to update the outdated 1935 regulations, as things had changed with the two systems in operation. Because there was a price difference now between Private Hire Cabs and Public Rank Taxis, restrictions were imposed by the Motor Traffic Office on Private Hire operators and drivers. They could no longer pick up from Taxi Ranks or hailed fares off the streets and were not allowed to display Taxi roof signs. This was to stop any confusion for the customers, but later during the 1990's the States of Jersey Defence Committee relaxed some of these rules which really has created the confusion that the general public have over the two systems of Taxicabs in operation today. We have seen many changes over the years, (TTS) Jersey States Transport and Technical Services have taken the reins of governing and regulating the Taxi industry in Jersey, and the Motor Traffic office changed its name to Driver and Vehicles Standards Department (DVS). There has been considerable growth of the modern communication technology with the increase in smart phones and apps and satellite navigation, 2011 saw the launch of many digital hailing applications for taxicab operators through smartphones, many of these applications also facilitate payment and tracking of the Taxicabs. There has been vehicle improvements with the drive for more Eco friendly cars and hybrids vehicles like the Toyota Prius being used as Taxicabs, recently we saw the launch of the new Electric Taxi in London called the Metrocab which can run on zero emissions, there's also been a significant increase in car sharing and car back services around the world like Urber which has caused much controversy amongst Taxicab drivers mainly because it's totally unregulated. At this moment in time no JTDA members are affiliated to any Taxi app in Jersey, mainly because they cannot support the use of any booking app that welcomes both Public Rank Taxis and Private Hire Taxicabs onto the same system. The JTDA members feel strongly that it would not be right or fair for anyone to order a taxicab using a smart phone app and then it would be pot luck with type of vehicle turns up, as they would be charged a different fare depending on either a Public Rank Taxi with controlled fares or a Private Hire Taxicab with higher tariffs. The JTDA has over 90 Public Rank Taxi Drivers in the association and depending on the new Taxicab regulations due out at anytime we may be looking at these new advances in customer communications technology. Testing the OPTI on London streets the driverless vehicles of the future! Well here in Jersey we are all waiting with bated breath to see what the futures holds, we have been told by the new Minister for Transport and Technical Services (TTS) that the new reforms would be out by the end of the easter period, then it was put back to the end of August, both have come and gone now so we are still waiting to hear what our future will be?. As for future Taxicab transport it looks like we could all be out of work with the likes of Google testing new satellite navigated driverless vehicles and Paul Piliste has conceptualized the OPTI ﻿﻿an eco friendly driverless Taxi for London, which could hit the street we are told with sheer style and smartness in 2025! 'I don't know about you but I wouldn't want to trust a driverless vehicle relying purely on its SatNav to get my family home safely!'. The difference between a ‘Taxi’ and a ‘Cab’ is that a Taxi has a Taximeter. It’s often claimed the Taximeter was invented by German Baron von Thurn und Taxis – descendant of the Italian Tasso (meaning ‘badger’) family. In fact, it was Wilhelm Bruhn and the word comes from French: ‘Taxi’ meaning ‘Tax’ and Metre. There are a number of myths and legends that surround the London Cab and its cabmen and many of them are nothing but bunkum. For instance, it has never been law for a motor cabman to carry a bale of hay in his cab. In fact, it was never law for a horse cabman to carry one, although he was required to carry sufficient hard food (e. g. oats) for his horse’s midday feed. Nor has there ever been a law that says that London’s Taxis should be black. A Taxicab may be any colour, but when the Oxford and the FX3 were introduced, their makers supplied them in a standard colour of black. Few buyers were prepared to pay the extra money for a special colour and so for three decades, black became the norm. In the late 1970s, Carbodies offered a wide range of pleasing colours for the FX4 to the ever-growing number of owner-drivers and now Taxicabs are found in a very wide range of colours, including special advertising liveries.